If one had to choose just one work that proves that Giuseppe Verdi is the Shakespeare of opera, then it has to be Rigoletto. Based on Victor Hugo’s Le Roi s’amuse, Verdi, as ever courting controversy, created his most fully-fledged character in Rigoletto to date. As jester to the libidinous Duke of Mantua, Rigoletto’s readiness to mock his master’s victims is despicable; yet, at one and the same time, he is revealed to be a loving father to Gilda whom he endeavours to protect from the evils of the world. When the Duke starts to pursue his daughter, Rigoletto’s mood darkens. He confronts Gilda with the truth about her lover, but her naivety prevents her from seeing the Duke for what he truly is. When Rigoletto resorts to hiring Sparafucile to assassinate the Duke, he unwittingly signs Gilda’s death warrant. Premiered at the Teatro La Fenice in Venice on 11 March 1851, Rigoletto contains all the ingredients that make for great drama; a black comedy that culminates in a very human tragedy, combining moments of depravity and lasciviousness with others of tenderness and innocence. 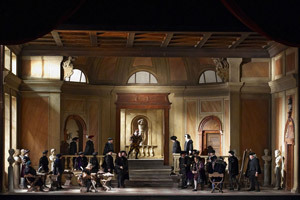 And if the quality of the story wasn’t enough, Rigoletto, as an opera, includes some of Verdi’s very best music. Each time Verdi came up with a melody, he seemed to have the capacity to effortlessly surpass it with another. Now returning to the Wiener Staatsoper, there are many reasons for going to this wonderful opera. But if you need just one, hearing “La donna è mobile” in context, and seeing Mantua for the scoundrel he truly is, is a joy not to be missed.